Like it or not, massive trainers are here and they aren’t going anywhere fast. Not that they could even if they wanted to, mind you. To the casual observer, it may have come as a bit of a shock when the fashion elite suddenly appeared to be taking their style cues from Sporty Spice in a pair of Sketchers circa 1995, but it’s actually a pretty natural progression. Think of it as footwear’s answer to the loosening and widening of silhouettes we’ve been seeing in fashion for some time now. After several years of clean, white minimalism and slim, sock-like fits in the world of trainers, it was only a matter of time before things swung around and began going in the opposite direction. The Raf Simons X Adidas Ozweego was one of the first ‘ugly trainers’ to really kick things up a gear, but it was with the release of Balenciaga’s much-hyped Triple S sneaker that this clumpy footwear craze really took flight. “In terms of fashion, footwear was about low profile, simple shoes, like Stan Smiths, Roshe Runs or Common Projects Achilles Lows,” explains Andrew Brines, buyer at renowned premium fashion e-tailer, Oki-Ni. The End Of The Minimalist Sneaker? So does the chunky trainer movement spell disaster for minimalist footwear? MatchesFashion’s Ben Carr doesn’t think so, but he’s not surprised that there has been a shift. “While I don’t think the clean sneaker is going anywhere, there is certainly a ubiquity to their presence in modern menswear. Think about it, if you are a teenager and your dad is wearing a minimal sneaker then you’re not going to want to adopt this style are you? Chunky trainers are currently shattering paving slabs at fashion weeks across the globe, but incorporating them into a workable, everyday wardrobe can understandably present a little bit of a challenge. So, blame Raf Simons, blame Balenciaga, blame your dad – whoever is truly responsible for the rise of the beetle crushers is irrelevant. The fact of the matter is that trainers are titanic now and you should probably join the party before it’s too late. Ready to embrace one of the most divisive trends to emerge from the murky depths of Lake Fashion since the return of the bowl haircut? These are the best sneakers at every price point if you want to join the chunky trainer club. Okay, let’s get it out of the way. You can’t talk about chunky trainers without mentioning Balenciaga. Since the appointment of Vetements boss Demna Gvasalia as creative director back in late 2015, the luxury Spanish label has become one of the most forward-thinking names in fashion and the now-iconic Triple S sneaker is without doubt its crowning glory. Taking inspiration from orthotic footwear and the type of trainers favoured by tourists, the Triple S eclipsed its stripped-back predecessors and quickly became a regular sight at fashion weeks as well as a grail purchase for hypebeasts and high-fashion disciples alike. A British sportswear brand with a background in chunky trainers. This latest trend has thrust the Bolton-born label back into the spotlight and many of the silhouettes from its archives are looking more relevant today than ever before. This innovative shoe featuring Reebok’s ground-breaking ‘Pump’ cushioning system was first launched in 1994 but in recent years has found a place on the shoe racks of fashionistos as well as Mr Motivators. The Insta Pump Fury has been reimagined by brands ranging from BAPE to Vetements and has earned a cult-like following in the process, making it one of the coolest chunky sneakers you can have in your rotation. 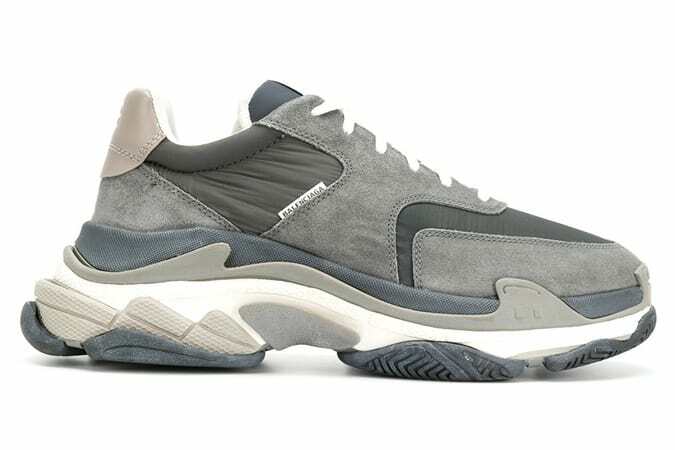 The Balenciaga Triple S may have kick-started this whole thing but would it have even come into existence if it hadn’t been for the long-running collaborative effort between German sportswear giant Adidas and Belgian tastemaker Raf Simons? Well, perhaps not. The Ozweego III is the latest design in the ground-breaking Ozweego line. Maybe you love them, maybe you loathe them, but however you feel about this beautifully ugly piece of footwear, you can’t deny it’s fun to look at. Bostonian shoemaker New Balance has been doing its thing since the turn of the 20th century and has picked up a few tricks along the way. The brand produces the vast majority of its products either stateside in New England, or across the pond in, well, old England. The result is some of the most comfortable, highest quality sneakers available to buy – no wonder NB is such a hit with sneakerheads and athletes alike. Apple co-founder Steve Jobs was onto something when he picked these bad boys out as part of his signature look. A true classic and bang on trend. You can’t think of sneakers without thinking of Nike. The sportswear heavyweight has been doing big trainers longer than most. In fact, some of it’s most iconic footwear designs – which could give the Triple S a run for its money in the chunkiness stakes – come from a time when Demna Gvasalia would still have been wearing nappies. The Air Max 95 is nothing short of a classic and offers the perfect way to dip your toes into the chunky trainer trend without losing any mates in the process. Swedish fashion chain H&M is known for bringing a subtle touch of Scandinavian minimalism to the high street, but as the fashion landscape continues to evolve in unexpected ways, stripped-back is out and OTT is in. These highly detailed, chunky kicks from H&M are in keeping with the trend while still managing to look clean and crisp at the same time. If you want a pair of big sneaks that will go with 99 per cent of your wardrobe – quite an ask even for regular trainers – then these might be your best bet. If there’s something new bubbling away in the world of fashion, you can bet it won’t be long before Zara starts churning out its own version of whatever that may be. The trend for dad-esque footwear is no different and the Spanish high-street stalwart has already put out a number of designs. With a thicker-than-thick sole and plenty of contrasting materials to the upper, it’s no mystery where this model took its inspiration from. However, with change left over from £50, this is one way to keep abreast of the trend while ensuring your wallet remains intact. Parisian label A.P.C. is famous for its high-quality, no-fuss wardrobe essentials. If we had to sum its output up in a word, it would probably be ‘understated’ – something which you probably wouldn’t have thought would gel very well with the current preference for sneakers that look like they’re on steroids. But despite this little discrepancy, A.P.C. has churned out some of the most inoffensive, versatile and ultimately wearable chunky trainers we’ve seen. Clock the signature, subtle branding and a look that manages somehow to be both showy and restrained simultaneously. If you’re keen to give a new look a go but aren’t so hot on the idea of signing up for any medical trials to finance it then ASOS should be your first port of call. The online fashion mecca is full of the latest styles, with bargain options from its in-house line sitting alongside designer pieces from your favourite names. With a thick, chunky sole and vibrant hits of green and blue, these eye-catching stompers from ASOS offer the perfect opportunity to get some heads turning for all the right reasons.